It’s not Rooooooski! It’s an abstract facsmile of Rooooooski! You don’t see it? But have I chosen to reveal it? This is the question you’ll have to deal with! The poor, oppressed, 5th-wheel bits! You can’t grasp it? Then you’re an ignorant, Christian have-wit! What will the bureaucrat do for Tuesday? You don’t weep for it? Analysis: An odd song with an odd story and odd structure, this upbeat and fun tune with deep philosophical lyrics came together in an odd way. Like most songs on Imaginary Line I, a demo was brought to Saturation Acres where a new, professional recording was initiated. But unlike any other song, the demo version was ultimately included on the album as the studio version was determined to be too slow to capture the mood of this song. The original version of this song was written in 1997 and named “Episode IV” as it narrated the story of the first Star Wars film. The alternate, studio recorded version of “Lorelei” was used for J.D. Cook’s 19th birthday tribute as he had long claimed this to be his favorite Imaginary Lines song. To offer your own analysis of Lorelei, please leave a comment in the box below. You can never be wrong! Analysis: The layered soundscapes enrich this song as it migrates from section to section, in a gloomy and fatalistic creed. “Perfect Light” was written in response to a pathetic, “puff piece” version of The E True Hollywood Story on an established mainstream actor. Please offer your own analysis of Perfect Light by leaving a comment in the box below. From the serrated, glassy desert floor you now rise! Analysis: Although this was an excellent “kick-off” song, it is probably the weakest song on Imaginary Lines I. It does nicely build tension before releasing energy during the bridge and outtro sections, but suffers from weak vocals and a muddled overall mix. This auto-biographical song was written by Ric Albano on his 36th Birthday. The lyric “It appears you found a new direction, pointed towards the sky” is influenced by the rare dystopian song by Pink Floyd called “Point Me At the Sky”, which contains the lyric “And if you survive ’til 2005 I hope you’re exceedingly thin / For if you are stout you will have to breathe out while the people around you breathe in”. Please offer your own analysis of The Phoenix by leaving a comment in the box below. 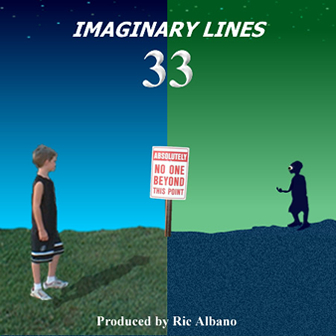 Imaginary Lines 33 is a compilation album which is actually three albums in one. It includes the entirity of two previous releases, Imaginary Lines I in 2005 and Imaginary Lines II in 2007, plus several new and previously unreleased tracks. In all, its 33 songs have a combined running time of nearly two and a half hours. This album came together when the project’s producer, Ric Albano, decided to abandon the originally-planned “trilogy” of albums because he did not feel there was enough quality material to make an adeguate Imaginary Lines III. Instead the focus shifted to enhancing previously released material and developing the better songs of the unreleased music.